Wintery weather has snarled my travel plans somewhat. I’ve been feeling a bit like the characters in “Planes, Trains, and Automobiles” having to cobble together various arrangements to get from point A to point B. My laugh of the trip occurred after dealing with a canceled flight from Chicago’s Midway Airport. Fortunately, I was able to quickly book a rental car, then grabbed some caffeine at a local restaurant and headed on my way. Since I was in a hurry to get ahead of traffic, I didn’t look at my receipt in detail until I was several hours away, snug in my hotel and working on my expense report. 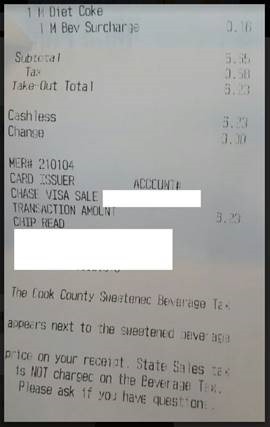 Apparently Diet Coke is now a “sweetened beverage,” at least according to this charge under the Cook County Sweetened Beverage Tax. I did a quick Internet search to see if it applied to all soda or just drinks with sugar and found out that the tax has been repealed and actually expired December 1, 2017. I guess a software update is in order for this point of sale system. I was immediately missing my other clients who are located in warmer climates, but enjoyed working with a new chief medical officer who wanted an independent opinion of his hospital’s long-range plan. It was a good change to be able to do some forward-looking work rather than the clean-up and troubleshooting involved in some of my engagements. As more seasoned physicians retire, I’m seeing younger physicians move into leadership positions. These newly-minted leaders may have MBAs or MHAs, but not a lot of experience managing their peers, especially if those colleagues have been on staff for a long time. Larger organizations may have resources in place to mentor these physicians, but others hope they’ll just grow organically into what the hospital needs. I’ve been through enough formal leadership development exercises to know that the skills they will need aren’t going to just appear overnight. Various organizations including EHR vendors offer “boot camp” programs for new medical leaders. The ones I know of are pretty solid programs, but some of them are expensive and might be only offered once a year. They are generally a couple of days of intense meetings and quite a bit of instruction. For a new medical leader, it can be a bit like drinking from the proverbial fire hose. Then, when you return to your day job, it can be hard to try to apply some of the strategic concepts that you were presented with when you’re struggling with day-to-day issues. You might also be trying to learn the EHR systems while building a clinical practice. You may also have to figure out the best way to deal with colleagues who are looking to possibly manipulate new leadership into giving in to their demands. We’ve all heard stories of medical members that set upon a new chief of staff or chief medical officer and try to convince him or her that the EHR is the root of all evil and needs to be replaced. Some dive in and investigate before coming to their own conclusions, and others take reports of widespread dysfunction for fact, which can be disastrous if acted upon out of context. There are many power dynamics at play within the average hospital’s medical staff organization. When new leaders are brought in from the outside, it can create uncertainty, distrust, and in some situations, it might even bring out some underlying paranoia. I’ve worked with clients like that, who have medical staff members who are convinced that new leadership has been brought in strictly for the purpose of shaking things up and that the new CMO or CMIO is going to try to fire everyone. Although there are certainly situations where some serious housekeeping needs to take place, for the most part, hospital administrators aren’t looking to completely clean house. There may be a few disruptive physicians who need to be dealt with, but it’s not exactly easy to replace an entire medical staff, especially if the physicians are voluntarily on staff rather than employees. One wouldn’t want to lose the referral base that comes with community-based physicians, especially if the facility has a solid referral network that is tied to an accountable care or other risk-sharing platform. At times I think about going back to the CMIO trenches, but then I’m reminded of how a new CMIO is sometimes treated. I’ve worked in an organization that had a previous CMIO who I replaced and that can be difficult if your predecessor was well liked or if there was very little boat-rocking. I’ve been around when the CMIO position is newly created and that can have challenges as well. Technology leaders can be nervous that the CMIO will meddle in their affairs and operational leaders can be suspicious as well. Other clinical leaders can be worried about losing control of their departments or service lines, especially if the new CMIO is overly enthusiastic. In my first CMIO position, I was subjected to senior members of the medical staff who demanded referrals, and sometimes not very subtly. It was implied that I’d need to send business their way if I expected their support in medical staff matters. I had a close friend who became the first CMIO at a large health system. Since he came from the ambulatory side, the hospital medical leaders didn’t trust him. Other ambulatory physicians didn’t trust the fact that he was a generalist. One particular senior cardiologist continuously harassed the new CMIO, telling everyone that he personally would have been better suited for the job even though he had no informatics experience and didn’t apply for the position. The organization’s leadership didn’t do much to help solve the problem, especially the CIO, who was more interested in how the organization appeared on “best places to work” lists than he was in how the clinical and financial systems were performing and whether the health system was receiving solid return on investment. I’ve looked at some open CMIO positions and it’s hard to think about uprooting yourself and moving to an environment that might not be quite as advertised. I’ve been on site with clients who put on a great show for visitors, then as you become more familiar and they let their guard down, you learn things that want to make you run shrieking away. Several of the positions require candidates who have completed Epic rollouts from soup to nuts, which puts those of us who come from best-of-breed organizations at a slight disadvantage. I’m not thinking about making a change in the near future, but always like to keep my eye out for interesting opportunities. Looking for a CMIO, particularly in a warm locale that doesn’t have a tax on Diet Coke? Email me. This one snuck up on me so I’m not clear on the whys and wherefores! Kinda silly!